اسمعیلی رینه, سمیه. (1397). تنوع زیستی دوجورپایان زیرزمینی جنس Niphargus در ایران با معرفی ثبت جدید گونه N. hosseiniei. فصلنامه محیط زیست جانوری, 10(4), 357-364. سمیه اسمعیلی رینه. "تنوع زیستی دوجورپایان زیرزمینی جنس Niphargus در ایران با معرفی ثبت جدید گونه N. hosseiniei". 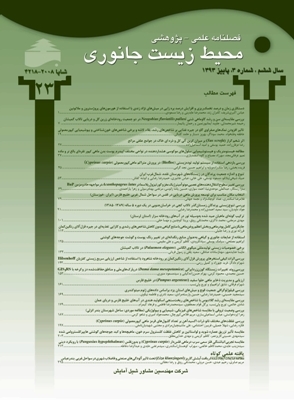 فصلنامه محیط زیست جانوری, 10, 4, 1397, 357-364. اسمعیلی رینه, سمیه. (1397). 'تنوع زیستی دوجورپایان زیرزمینی جنس Niphargus در ایران با معرفی ثبت جدید گونه N. hosseiniei', فصلنامه محیط زیست جانوری, 10(4), pp. 357-364. اسمعیلی رینه, سمیه. تنوع زیستی دوجورپایان زیرزمینی جنس Niphargus در ایران با معرفی ثبت جدید گونه N. hosseiniei. فصلنامه محیط زیست جانوری, 1397; 10(4): 357-364. اعضای جنس زیرزمینی 1849Schiödte, Niphargus در آب‌های زیرزمینی و یا آب‌های مرتبط با محیط‌های زیرزمینی نظیر چشمه‌ها زندگی می‌کنند. اعضای این گروه یکی از غنی‌ترین جنس‌های دوجورپایان آب شیرین از نظر تعداد گونه (بیش از 300 گونه و زیر گونه) در جهان هستند که در غرب پاله آرکتیک پراکنش دارند. ایران به ­عنوان محدوده شرقی جنس Niphargus مشخص می‌شود و تاکنون 17 گونه از این جنس در ایران یافت شده است که به‌جز گونه N. valachicus، سایر گونه‌ها بومی ایران می‌باشند. در این مطالعه، تنوع و پراکنش اعضای این جنس در ایران و صفات تشخیصی مهم هر گونه بررسی و ثبت جدیدی از گونه N. hosseiniei در اطراف روستای بیلوار شهر کرمانشاه گزارش می‌شود. نقشه توزیع جغرافیایی گونه‌ها با نرم ­افزار Arc GIs ترسیم گردید. اکثر گونه‌های این جنس از ایران در 5 سال گذشته معرفی شده‌اند و انتظار می‌رود در آینده‌ای نزدیک گونه‌های بیش­تری به فون زیرزمینی ایران اضافه گردد. Akbulut, M.; Bat, L.; Sezgin, M. and Çulha, M., 2001. On the occurrence of Niphargus valachicus Dobrenau & Manolache, 1933 (Amphipoda, Gammaridae) in the Western Black Sea Region of Turkey. Turkish Journal of Zoology. Vol. 25, No. 3, pp: 235-239. Barnard, J. and Barnard, C.M., 1983. Freshwater amphipoda of the world I. evolutionary pattern, II. Handbook and Bibliography. Hayfield Associates, Mt. Vernon, Virginia. 830 p.
Bay, L.K. and Caley, M.J., 2011. Greater genetic diversity in spatially restricted coral reef fishes suggests secondary contact among differentiated lineages. Diversity. Vol. 3, pp: 483-502. Boutin, C. and Coineau, N., 2000. Evolutionary rates and phylogenetic age in some stygiobiontic specie in Subterranean Ecosystems, edited by H. Wilkens, D.C. Culver and W. Humphreys. Amsterdam and New York, Elsevier. 410 p.
Brusca, R.C. and Brusca, G.J., 2003. Invertebrates. 2rd Ed. Sinauer Associates. Sunderland, MA. 935 p.
Christensen, V. and Pauly, D., 1992. Ecopath II-software for balancing steady state ecosystem models and calculating network characteristics. Ecological Modelling. Vol. 61, No. 1, pp: 169-185. Culver, D., 1982. Cave life, evolution and ecology. Harvard University Press. Cambridge. Massachusetts. 189 p.
Dobreanu, E. and Manolache, C., 1933. Beitrag zur kenntnis der Amphipoden Rumniens. Notationes Biologicae Bucarest. Vol. 1, pp: 103-108. Endler, J.A., 1986.Natural selection in the wild. Princeton University Press. USA. 336 p.
Esmaeili-Rineh, S. and Sari, A., 2013. Two new species of Niphargus Schiödte, 1849 (Crustacea: Amphipoda: Niphargidae) from two caves in Iran. Journal of Natural History. Vol. 47, No. 41, pp: 2649-2669. Esmaeili-Rineh, S.; Sari, A. and Fišer, C., 2015a. Making future taxonomy of Niphargus (Crustacea: Amphipoda: Niphargidae) in the Middle East easier: DELTA database of Middle East species with description of four new species from Iran. Zootaxa. Vol. 4020, pp: 401-430. Esmaeili-Rineh, S.; Sari, A.; Delić, T.; Moškrič, A. and Fišer, C., 2015b. Molecular phylogeny of the subterranean genus Niphargus (Crustacea: Amphipoda) in the Middle East: a comparison with european niphargids. Zoological Journal of Linnean Society. Vol. 175, No. 4, pp: 812-826. Esmaeili-Rineh, S.; Heidari, F.; Fišer, C. and Akmali, V., 2016. Description of new endemic species of the genus Niphargus Schiödte, 1849 (Amphipoda: Niphargidae) from a karst spring in Zagros Mountains in Iran. Zootaxa. Vol. 4126, No. 3, pp: 338-350. Esmaeili-Rineh, S.; Mirghaffari S.A. and Sharifi, M., 2017a. The description of a new species of Niphargus from Iran based on morphological and molecular data. Subterranean Biology. Vol. 22, pp: 43-58. Esmaeili-Rineh, S.; Sari, A.; Fišer, C. and Bargrizaneh, Z., 2017b. Completion of molecular taxonomy: description of four amphipod species (Crustacea: Amphipoda: Niphargidae) from Iran and release of database for morphological taxonomy. Zoologischer Anzeiger. Vol. 271, pp: 57-79. Fišer, C.; Sket, B. and Trontelj, P., 2008. A phylogenetic perspective on 160 years of troubled taxonomy of Niphargus (Crustacea: Amphipoda). Zoologica Scripta. Vol. 37, No. 6, pp: 665-680. Fišer, C.; Trontelj, P.; Luštrik, R. and Sket, B., 2009. Toward a unified taxonomy of Niphargus (Crustacea: Amphipoda): a review of morphological variability. Zootaxa. Vol. 2061, pp: 1-22. Fišer, C.; Zagmajster, M. and Zakšek, V., 2013. Coevolution of life history traits and morphology in female subterranean amphipods. Nordic Society Oikos. Vol. 122, No. 5, pp: 770-778. Flot, J.F. ; Dattagupta, S. and Woerheide, G., 2010. Unsuspected diversity of Niphargus amphipods in the chemoautotrophic cave ecosystem of Frasassi, central Italy. BMC Evolutionary Biology. Vol. 10, pp: 171-184. Hekmatara, M.; Sari, A. and Heidary Baladehi, M.H., 2011. Two new Gammarus species (Crustacea: Amphipoda: Gammaridae) from Zagros Mountains, Iran. Zootaxa. Vol. 2894, pp: 39-57. Hekmatara, M.; Zakšek, V.; Heidari, M.B. and Fišer, C., 2013. Two new species of Niphargus Crustacea: Amphipoda) from Iran. Journal of Natural History. Vol. 47, No. 21, pp: 1421-1449. Karaman, G.S. and Ruffo, S., 1986. Amphipoda: Niphargus group (Niphargidae sensu Bousfield, 1982), in Stygofauna Mundi. Edited by Botosaneau, Leiden. E.J. Brill/ Dr Backhuys. pp: 514-534. Karaman, G.S., 1998. First discovery of the family Niphargidae (Gammaridea) in Iran (contribution to the knowledge of the Amphipoda 243). Glasnik Republičkog zavoda zaštite prirode- Prirodnjačkog muzeja Podgorica. Vol. 12, pp: 9-22. Papadopoulu, A.; Anastasiou, I. and Vogler, A.P., 2010. Revisiting the insect mitochondrial molecular clock: the midaegean trench calibration. Molecular Biology and Evolution. Vol. 27, pp: 1659-1672. Raeisi, E., 2004. Iran cave and karst, in Encyclopedia of Cave and Karst. edited by J. Gunn, Fitzroy Dearborn. New York, USA. pp: 460-461. Schram, F.R., 1986. Crustacean. Oxford University Press. New York, USA. 660 p.
Sket, B., 1999. The nature of biodiversity in hypogean waters and how it is endangered. Biodiversity and Conservation. Vol. 8, pp: 1319-1338. Trontelj, P.; Blejec, A. and Fišer, C., 2012. Ecomorphological convergence of cave communities. Evolution. Vol. 66, pp: 3852-3865. Väinölä, R.; Witt, J.D.S. ; Grabowski, M.; Bradbury, J.H. ; Jazdzewski, K. and Sket, B., 2008. Global diversity of amphipods (Amphipoda; Crustacea) in freshwater. Hydrobiologia. Vol. 595, pp: 241-255.